A few years ago when we still lived in the city, we started a vegetable garden in our back yard with about four or five tomato plants. We heard great things about using chicken manure as a fertilizer, so we covered the soil around the tomato vines with pine shavings from the chicken coop. It worked incredibly well and the plants took off like crazy giving us a bumper crop of delicious tomatoes. At the end of the season, we had many green tomatoes still on the vine that would not ripen. I asked my mom if there was anything we could do to get them to ripen indoors, and she told me about the newspaper trick. Have you heard of it? I just picked the green tomatoes off the vine, wrapped them loosely in newspaper, and stored in our dining room. I checked them every few days to see if any were ripe because if left wrapped too long, the ripe tomatoes started to rot. I was really surprised that it actually worked! We had some green tomatoes still on the vine from this year's garden, so we're trying the newspaper trick again. 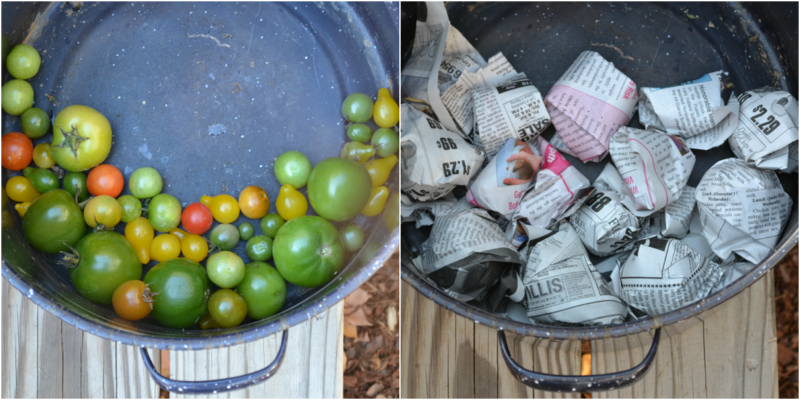 Last Sunday I picked the remaining tomatoes off the vines and sorted them into the newspaper pile for wrapping, the chicken treat pile if they weren't suitable for ripening, or the eating pile because some of them were already ripe and ready to go. I hope it works for us again this year! When I was pulling the tomatoes off the vines, I found this one cute little cherry tomato that had a star pattern on top. I guess from the stem? Not really sure what caused it, but I thought it was so cute! Have you tried the newspaper trick? Or do you have another way of getting green tomatoes to ripen indoors? We'd love to hear any other methods you'd like to share. And last but not least, we'd like to wish all of our American readers a very happy Thanksgiving holiday. We are so grateful for each and every one of you (American or not!) who reads and takes the time to leave a comment. It is so nice to feel validated and encouraged and we truly appreciate it. I already miss fresh garden tomatoes, our season ended a while ago. I was hoping to put the cold frames over the plants to extend the season, but didn't get it done in time. I usually leave the green tomatoes on the counter or put them in a paper bag, but I'll have to try newspaper next time. Thanks for sharing and I hope you have a happy Thanksgiving s well! Wouldya just look at that star! How cool is that?!! I love the trick, although I haven't had cause to use it. Thanks for sharing this! I have done the newspaper before and it does work well to extend them into December even! Right now we have 3 strainers full and they are ripening so fast that I am using them up in soups, sauces, chilis and of course for fresh eating. Maybe I can wrap a few to take us into late December...Have a super amazing Thanksgiving! Blessings! I've heard of using brown paper bags, but not newspapers. Worth a try. Wishing you a Happy Thanksgiving! Thank you for this information! I guess it never occurred to me that I should wrap my tomatoes in newspaper. Great tip!!! Happy Thanksgiving my friend!!! Oh. One more thing. I think it's a great idea that you wrap those tomatoes individually, btw. That's a great tip; I'll have to tuck it into my tips notebook. Have a wonderful, joyful Thanksgiving! Great idea, I'll remember that assuming I get any tomatoes next year!! It was so bad this year we barely got any green ones, except for cherry tomatoes, plenty of those. What a neat idea, I have not heard of doing this with tomatoes. Thanks for sharing the tip. Have a Happy Thanksgiving! I've never heard of the newspaper trick. I hope it works well for you again! Happy Thanksgiving! That's a great tip - thanks. I can barely grow tomatoes outside, but now that I know I can ripen them inside, that's a help. We LOVE tomatoes in our house. I know my MIL used this method years ago when she was feeding a family of six. I've never seen a star tomato before! Neat find. I just found your blog thru Elaine at Sunny Simple Life. I've scrolled thru a bit and am liking what I'm reading. It's a well-written blog. At first I thought you might be Canadian but then I see you're from my grandma's neck 'o the woods in Missouri. I went there once (I'm West Coast-USA) and got to see towns I'd heard her mention when I was a tiny little thing, like Cabool, Lebanon, etc. Her family's farm was deep in back country, dirt roads but we think we finally nailed its location from ancient maps, where my ancestors going back several generations had rather vast acreage although, from what we could see, no one has lived on any of that rural land for a long, long time. This was almost 30 years ago; maybe it's different now. I think it was a city called Springfield where I experienced one of the most exciting storms of my younger life, with rain coming down in June like I'd never seen, not to mention the thunder and lightning. I don't have chickens but, so far, I like a lot of your recipes for good food, so I'll be back. I love how on so many blogs how everyone is wishing each other a Happy Thanksgiving Day today; yes, it is indeed a day of gratitude for U.S. Americans. So, Happy Thanksgiving to you! Hi Tammy.. Hope you had a lovely day.. I always put my tomatoes in brown paper bags a few at a time.. I find it too hard to unwrap the newspapers.. I had done that once.. I am just lazy, I guess.. Your weather is so much warmer than ours.. Our tomatoes are long gone.. I love them.. The frost this morning was so thick you would think it had snowed in the night but later today it was lovely..
Good tip - thanks for linking it in to Food on Friday. Have a great week. Nice trick! I love that tomatoe with the star pattern, it looks like a Christmas ornament, pretty! Thanks for sharing this with me Tammy, I am going to try this with my tomatoes.